Frustr8tor is a puzzle based on the classic 8 queens problem, in which you try to place 8 queens on a chess board without any queens attacking each other. In other words, you have to choose 8 squares of an 8×8 board such that no two chosen squares are in a line horizontally, vertically, or diagonally. 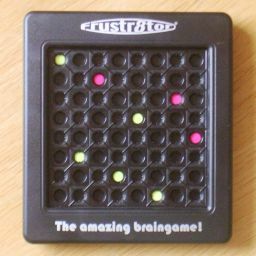 The Frustr8tor puzzle consists of a black frame with an 8×8 grid of holes in the front. 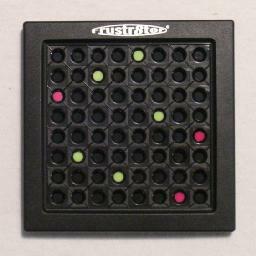 On the back there are two sliders in each column, which allow you to mark any of the holes in a column with either a red or a green dot. On the original version there are 28 challenges, given by numbers on the back of the puzzle. Put red markers at the two or three holes that have the number of the challenge you want to do, and then it is your task to place 5 or 6 green markers on the board to form an 8 queens pattern. Recently the puzzle has been restyled and re-released in a new version. It has 30 new challenges, instead of the 28 that the original had. The puzzle was invented by Albert Eckhardt and he was granted international patent WO 2006/098614, published 21 September 2006. Suppose three red dots have been placed. You can place the 5 green dots in 85 = 32,768 ways, one in each of the remaining columns. If you ensure no two dots lie in the same row, then there are only 5! = 120 ways to do this. In just one or two of these are there no two dots on the same diagonal. If you are solving a puzzle with only 2 red dots given, then there are 86 = 262,144 ways to fill the empty columns, but just 6! = 720 with no two dots in the same row. All together there are only 92 patterns of 8 dots with no two on a horizontal vertical or diagonal line. There are 92 eight-queen patterns, but this reduces to only 12 essentially unique patterns once symmetry is taken into account. There are 11 essentially unique asymmetrical patterns (accounting for 88 of the 92) and 1 symmetrical one (accounting for the remaining 4). The twelve patterns are shown below. The list of all solutions to the puzzle challenges on the current version of the Frustr8tor is currently hidden. Click to show the list of all the solutions. The following is a list of all solutions to the puzzle challenges on the current version of the Frustr8tor. Click to hide the list of solutions. The solution of one of the challenges on the current version of the Frustr8tor is shown below. Click to show all the solutions. The list of all solutions to the puzzle challenges on the original version of the Frustr8tor is currently hidden. Click to show the list of all the solutions. The following is a list of all solutions to the puzzle challenges on the original version of the Frustr8tor. Click to hide the list of solutions. The solution of one of the challenges on the original version of the Frustr8tor is shown below. Click to show all the solutions.